Home/Garden Care Tips, Lawn Care Tips/Organic vs. Synthetic – What’s Best for Your Lawn & Garden? Much like the food industry, many fertilizers do a poor job of defining “organic” on their packaging. Traditionally, the term “organic” refers to how the fertilizer was made, and has little to do with the presence of preservatives or pesticides (such as in food). Rather, organic fertilizer is the result of natural decomposition. When plant material and animal manure are left to compost on their own without human intervention, the result is nutrient-rich organic fertilizer. Like all fertilizers, organic substances provide plants with nutrients they need to thrive. Most fertilizers will list the essential nutrients they provide on their packaging, as certain plants need different nutrients than others. Organic fertilizer mimics the same processes which naturally occur throughout your garden, so many landscapers believe it’s better for their plants – and while organic fertilizer does offer a host of benefits, your plants won’t be able to tell the difference between organic and synthetic fertilizer. 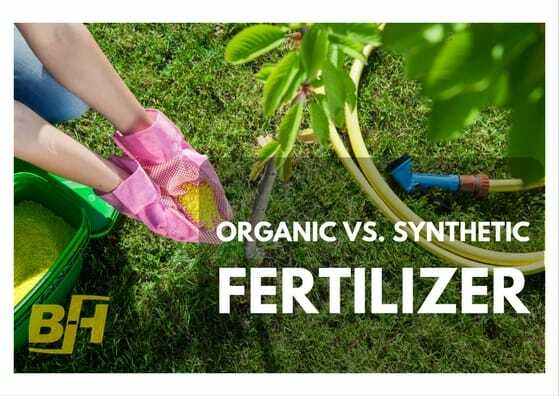 What is Synthetic Fertilizer, and How Does it Differ From Organic? Much like organic fertilizer, the term “synthetic” is used to describe how the fertilizer comes to be. Synthetic fertilizer isn’t created naturally like organic fertilizer – rather, it’s created with the aid of humans. Organic and inorganic materials are used as the foundation of the fertilizer, and humans use sophisticated processes to mimic the natural compost process. The end product is very similar to organic fertilizer, but it undergoes wildly different processing before it hits store shelves. Synthetic fertilizers offer many of the same benefits as organic fertilizers. They provide plants with a host of nutrients they need to flourish, and their packaging lists their guaranteed nutrients as well. Many gardeners believe synthetic fertilizer is easier to work with, and evidence suggests that synthetic fertilizer has higher nutrient stability – this means that your plants won’t run out of nitrogen in their fertilizer several weeks after it’s applied. Which Fertilizer is Best for My Garden? There are a number of factors you should consider when choosing fertilizer for your garden. Synthetic fertilizer is usually easier to use than organic fertilizer, and it maintains stable nutrient content for a longer period of time. Furthermore, nutrients in synthetic fertilizer are available to plants immediately after it’s applied, so you’ll see improvement in your plants in as short as a few days. Organic fertilizers offer their own set of benefits for your plants. Many organic fertilizers are slow-release, meaning you won’t have to worry about over-fertilization. In addition, organic fertilizers improve the structure of your soil as they break down, which can improve the health of your garden long after your plants have absorbed the organic substance of its nutrients. Organic fertilizer can be more expensive than synthetic options when purchased off of store shelves, but you can also make it at home with a simple compost set-up. Ultimately, both organic and synthetic fertilizer will provide your plants with the nutrients they need to thrive. If you are unsure as to which fertilizer is best for your garden, contact Bur-Han today to learn more. Our landscaping team has the knowledge to help you pick the right fertilizer for your garden, so you can provide your plants with the nutrients they need to flourish.